Steven Curtis Chapman's youngest child (pictured) died Wednesday evening after being struck by a car driven by her teenage brother in the driveway of the family's Williamson County home. Maria, one of the Christian singer's six children, was taken by LifeFlight to Vanderbilt Hospital, which confirmed the death, according to Laura McPherson, a spokeswoman for the Tennessee Highway Patrol. The 5-year-old was hit by an SUV driven by her teenage brother, she said. Police did not give the driver's name. "It appears to be a terrible accident,'' McPherson said. Singer/songwriter Chapman, who recently was inducted into Music City Walk of Fame, is one of contemporary Christian music's most recognizable and most awarded names. 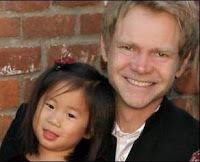 He and his wife, Mary Beth, have long been supporters of international adoption, having brought three girls from China into their family. Maria was the youngest. The couple is so active in the cause that they formed an organization, Shaohannah's Hope, to aid families wanting to adopt. With his latest music tour, which came through Nashville in November, Chapman started a campaign called "Change for Orphans." He asked audience members at each stop to bring spare change to the concert, where it was counted and given to a local family to aid in their adoption process. "I don't know of anybody who loves his children more than he does and is so committed to the adoption concept, and to lose one, no matter what the circumstances, is heartbreaking beyond all comprehension," said John Styll, president of the Nashville-based Gospel Music Association. "He talks about his kids all the time. That's his life. His kids are more important to him than music, that's for sure." Styll got the news not long after Maria's death. "I'm confident I can speak for everyone in the community to say we will do everything we can to support this family, as we would do at any time, but especially at a time like this," he said. Most of the Chapman family was at Vanderbilt children's hospital after the accident and could not be contacted. The long, gravel driveway leading to the home west of Franklin was blocked off by Williamson County sheriff's deputies. In addition, Chapman will not appear at his May 24 show. An artist appearing in his absence will be announced shortly.